Hello, apocalypters! 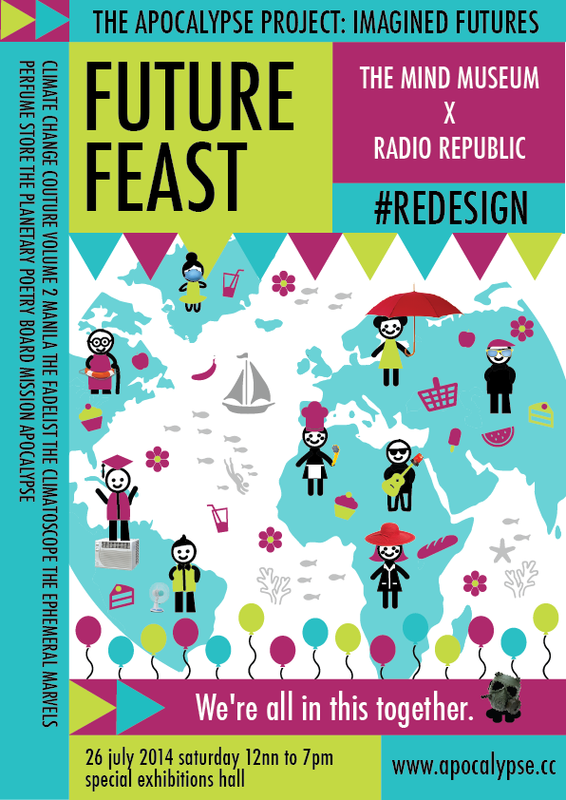 I’m excited to announce that as a culminating event for The Apocalypse Project: Imagined Futures, The Mind Museum is collaborating with Radio Republic to bring you Future Feast, a celebration of human creativity and our hopes for a sustainable future. 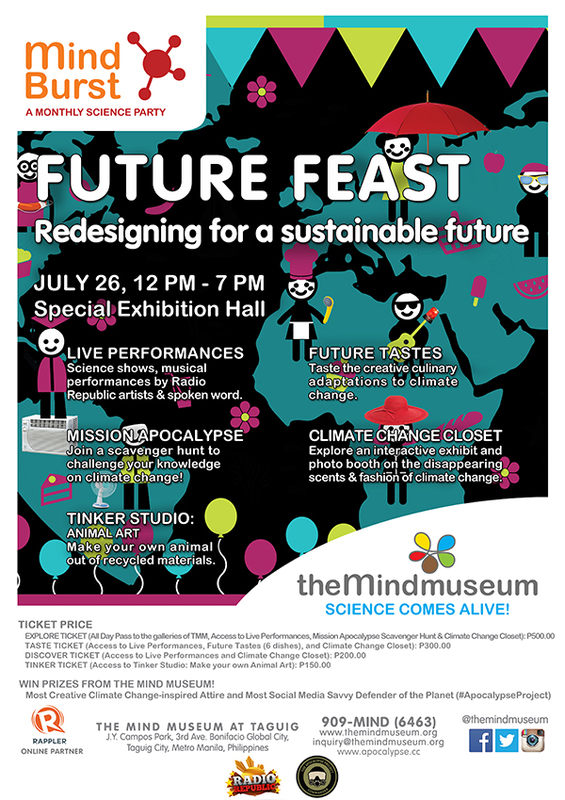 The event will be on July 26, Saturday, 12PM to 7PM at the Special Exhibition Hall of The Mind Museum. With the theme of Redesign, I am working with chefs who are creating new dishes for a Convenience Store of the Future. 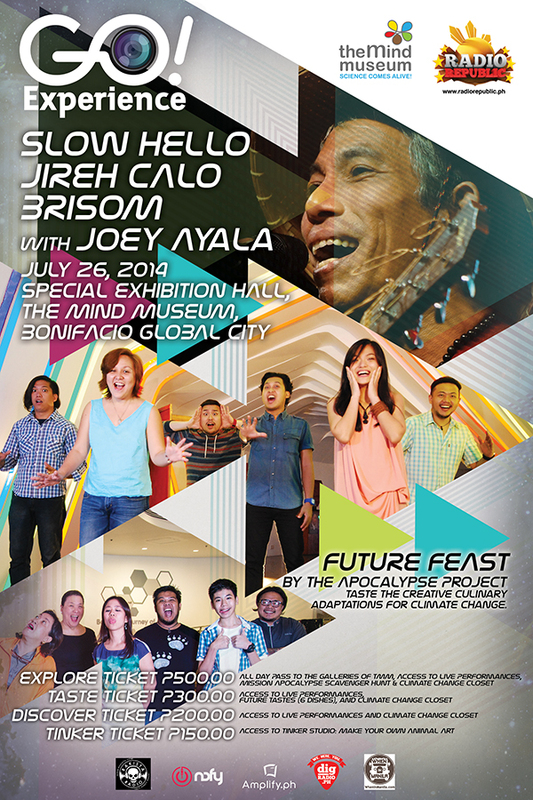 Radio Republic is bringing in their featured artists for July: Slow Hello, Jireh Calo, and Brisom. There will also be a performance by special guest artist Joey Ayala. This is an event for all ages, so bring in your families and get the kids to play at the Tinker Studio, watch spoken word performances and science shows, dress up in clothes from the Climate Change Closet and have your photos taken at the photo booth, smell the perfumes of The Ephemeral Marvels Perfume Store, participate in Mission Apocalypse Scavenger Hunt and win an Apocalypse Project Commander Badge, and think of how you can help build a sustainable future by making an Earth Pledge. You can buy tickets online here. You can also buy your tickets at the museum on the day of the event. No reservations are required.